When we talk about any gadget, particularly flagship smartphones, a lot of factors come into play to make a device worth purchasing. Just like any other product, gadgets also cater to the specific needs of an end consumer. How efficiently it caters to those needs determines for the most part whether it’ll be a success or a failure. One of these needs is durability. Despite advances in software and performance, durability and battery life remain a thorn in both manufacturer and consumers’ sides. Today, we’re here to see how well the OnePlus 5T fares in this feature. Take a look below to find out more. The OnePlus 5T is an amazing smartphone. Despite the company overshooting with its ‘flagship killer’ claims, the Chinese smartphone starlet delivers consistently this year. The 5T caters to nearly every aspect of the user experience. OnePlus cites its user surveys as the basis of equipping the 5T with certain features. The most important of these is the 3.5mm earphone jack, which the company believes helps users choose from a wider range of audio accessories. However, a big miss for the smartphone is waterproofing. If you’re planning to get one, don’t drop your OnePlus 5T in the water. 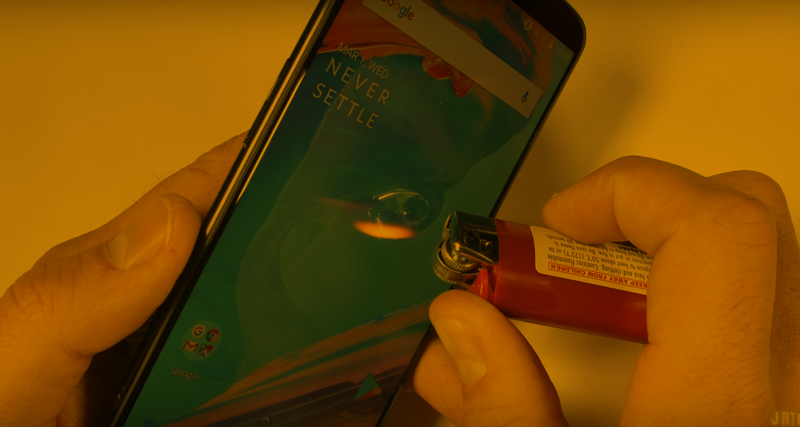 While we’d expect this to have a negative impact on the smartphone’s overall durability, today’s bend test proves otherwise. JerryRigEverything is back with his famous durability tests, and this time it’s the 5T that comes under his sights. The smartphone’s screen performs as you’d expect it under scratching conditions. The back however, is pretty resistant to most of the scratches you’d expect it to face under normal usage. Safe to say, if you don’t carry open steel cutters alongside your smartphone, your OnePlus 5T will be pretty safe against the majority of materials. The smartphone’s fingerprint sensor also fares similarly. Finally, when subjected against a bend test, not only does the 5T pass with flying colors, it also doesn’t separate the screen from the body – something you wouldn’t expect from a non-water resistant smartphone. For the price, the OnePlus 5T is the perfect combination of features and specifications. And it’s already up for sale in the US. Thoughts? Let us know what you think in the comments section below and stay tuned. We’ll keep you updated on the latest.